Whether your party is headed up the side of the forbidden volcano or down into Hell itself, no Game Master wants to slow the action down by drawing every lava flow and shattered boulder. Fortunately, with Paizo Publishing's latest Pathfinder Flip-mat, you don't have to! This line of gaming maps provides ready-to-use and captivatingly detailed fantasy set pieces for the busy Game Master. this double-sided combat map features islands in a river of fire, volcanic hot spots, and even a shattered temple! Don't waste your time sketching when you could be playing. 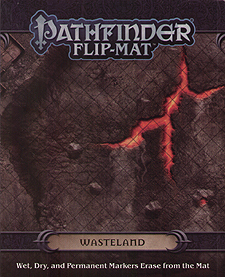 With Pathfinder Flip-Mat: Wasteland, you'll always be ready when your players venture into the badlands or decide to challenge the volcano goddess on her own turf!